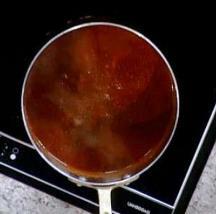 There are many variations of this Enchilada Sauce Recipe, but this one is a favorite restaurant sauce recipe. The word "enchilada" originally meant to season with chilies. Over time, because so many other recipes called for chili powder, "enchilada" now usually refers to a tortilla served with a chili-rich sauce, rather than the actual act of seasoning with chili powder. This enchilada sauce can be used in dozens of different ways. Of course you'll want to use it when you make enchiladas, but you'll also want to use it when you make the Three Bean Enchilada Chili, another favorite restaurant recipe on the website. You can incorporate this enchilada recipe in making a delicious tortilla soup and some of the restaurant customers like to use the sauce with eggs at breakfast, instead of a salsa or Tabasco sauce, and some use it with certain beef entrees at dinner. Carbs: Approximately 4.51 carbs per serving for 6 total servings. Preparation time: 30 minutes. Serves 6-8. Enjoy your Restaurant Sauce Recipe and the company of those you share it with!